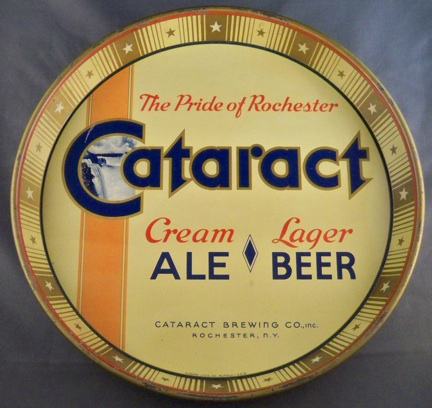 This tray from the Cataract Brewing Co. of Rochester N.Y. advertises its Cataract Cream Ale and Lager Beer. The tray dates to the 1930’s and is a 12″ round tray. There is another tray similar to this that advertises for just the Lager Beer, and another similar with a blue background instead of yellow. Overall this tray has nice color and graphics with good contrast between the Cataract logo in a nice blue font on the pale yellow background with orange vertical bar. The rim has a nice border of stripes and stars. This tray was manufactured by the Niagara Litho. Co. of Buffalo NY, which is not found as a manufacturer on many trays.